Since John F. Kennedy's presidency, this relationship has been distilled into a personalized daily report: a short summary of what the intelligence apparatus considers the most crucial information for the president to know that day about global threats and opportunities. This topsecret document is known as the President's Daily Brief, or, within national security circles, simply the Book.” Presidents have spent anywhere from a few moments (Richard Nixon) to a healthy part of their day (George W. Bush) consumed by its contents; some (Bill Clinton and George H. W. Bush) consider it far and away the most important document they saw on a regular basis while commander in chief. The details of most PDBs are highly classified, and will remain so for many years. But the process by which the intelligence community develops and presents the Book is a fascinating look into the operation of power at the highest levels. 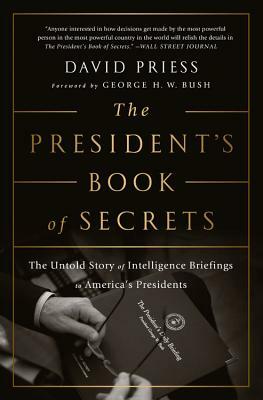 David Priess, a former intelligence officer and daily briefer, has interviewed every living president and vice president as well as more than one hundred others intimately involved with the production and delivery of the president's book of secrets. He offers an unprecedented window into the decision making of every president from Kennedy to Obama, with many characterrich stories revealed here for the first time. Dr. David Priess served during the Bill Clinton and George W. Bush administrations as an award-winning intelligence officer, manager, and daily intelligence briefer at the CIA, as well as a desk officer at the State Department. He obtained his PhD in political science from Duke University and has published articles in journals such as Security Studies, Middle East Policy, and the Mershon International Studies Review, as well as book reviews and eclectic articles in outlets ranging from Foreword to Skeptic. Priess is currently director of analytic services for Analytic Advantage, Inc., offering specialized training, mentoring, and consulting services to the intelligence community, other government offices, and the private sector.